Does Beyond Compare have a mode where it does not save the program configuration? I want to use it in a portable way from a readonly device like cdrom or in this case write protected flash drive. Yes, BC4 should be able to run from a Read only media, such as a CDRom. It isn't a mode, however; it will attempt the write but if it fails will continue to operate. For a CDROM, this presents no dialog, and the program continues. 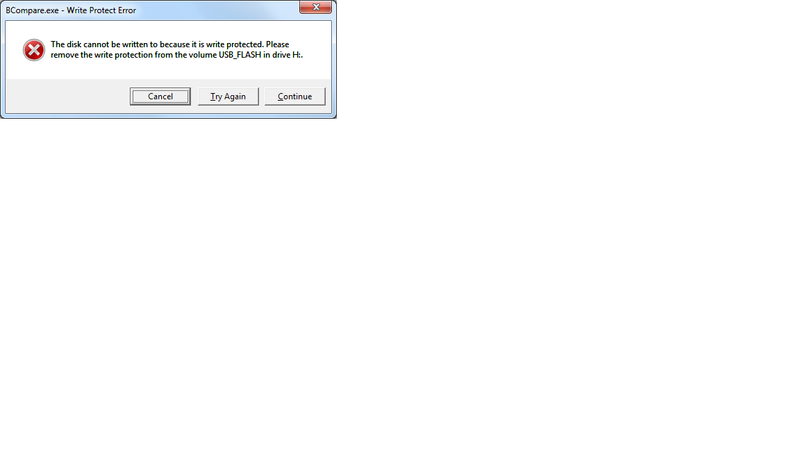 If you click Continue for this dialog, does it allow the program to continue to run? And, I assume you've used the Setup.exe's "Portable Install" option during the install process to create this install?